COMPLETE THIS FORM TO ARRANGE A VISIT OR SPEAK WITH US DIRECTLY. SCROLL DOWN FOR FAQS. WHAT ARE THE RESIDENCES AT ESPERANZA? Owned exclusively by its Members, The Residences consists of 63 beautifully appointed two, three, and four-bedroom villas, and 54 three and four bedroom villas round out the Auberge Private Residences. 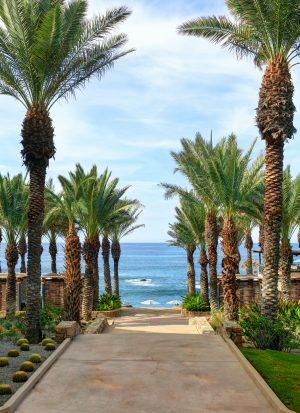 The architecture reflects the region’s Mexican style with palapa roofs, earth-tone walls, and terra cotta stone. The richly appointed residences feature handcrafted furnishings, local artwork, limestone floors, gourmet kitchens and spacious baths. All of the residences offer expansive views; outdoor patios and floor-to-ceiling glass doors that disappear into the walls to provide outside living in the wonderful tropical air. The Residences at Esperanza offer the opportunity to own a second home without the hassle. It’s the best of both worlds, the services and amenities of a world-class resort matched with maintenance-free ownership in a seaside vacation residence. WHAT ARE THE ADVANTAGES OF MEMBERSHIP IN A PRIVATE RESIDENCE CLUB? Ownership in a true Private Residence Club, like The Residences at Esperanza, afford the Members all the benefits of owning a vacation property of the highest quality for a fraction of the price you would expect to pay. Ownership at The Residences eliminates all of the hassles that are associated with owning a vacation home and provides you with the services and amenities only found in the finest resorts. Since there are only a limited number of Memberships available, you have the opportunity to use your vacation home as often as you like. Yes. Timeshare is typically characterized by a 'right of usage' with a very large group of people. Most often, there are 52 weeks that are sold to 52 different people for each unit, in which purchasers own the right to use a specific week. The Residences at Esperanza offers a very exclusive Membership that allows you to select the time you want to visit each year. And, you may use your Club as often as you desire at nominal per diem rates to simply cover expenses. IS OWNING REAL ESTATE IN MEXICO SIMILAR TO OWNING REAL ESTATE IN THE UNITED STATES? Yes. A fideicomiso, pronounced “FEE-DAY-E-CO-ME-SO”, is a means by which non-Mexican nationals own property in the Mexican restricted zone, which is any land or property located within 64 miles of the border or 31 miles of the Mexican coastline. Under Mexican fideicomiso law, ownership of your property is a contractual arrangement that functions exactly like a trust typically held in the United States for estate planning and other purposes. The beneficiaries of the fideicomiso retain all the exclusive rights to rent, sell, bequeath or otherwise use the property as they see fit. Contrary to the commonly held misconception, a Mexican fideicomiso is not a lease; it is a vehicle to ownership in which real property is transferred into a fideicomiso for the benefit of the owner or beneficiary. IS TITLE INSURANCE OFFERED ON LAND AND PROPERTY HELD IN A FIDEICOMISO? Yes. In fact, the developer owns a $61 million dollar policy on the 17-acre tract of land in which Esperanza exists. Additionally, title insurance for each ownership is available for purchase. Stewart Title Guarantee Company in Houston, Texas issues the title policy and it provides the same extensive title coverage one would expect on any property in the United States. HOW OFTEN MAY I USE MY MEMBERSHIP IN THE RESIDENCES AT ESPERANZA? Your membership at The Residences at Esperanza allows you to come as often as you like – your use is unlimited. Our concept allows you to enjoy your vacation home for a guaranteed minimum of four weeks each year during the prime season (October through June). If you are fortunate enough to have even more time to spend at your vacation home, the Club can accommodate you on a space-available basis with no cap on your length of stay. WHAT HAPPENS IF MY SCHEDULE CHANGES AND I CANNOT MAKE MY PLANNED WEEKS? If you are not able to use your planned weeks you can send family; friends; valued employees; gift to charity; to stay in your absence. You may also submit your weeks to the Auberge Resort rental program. The rental program provides Members with 60% of the gross revenues generated from the rental of your residence. Yes. Membership at The Residences at Esperanza allows you to utilize more than one residence at a time. A Member needs only to comply with the Use Agreement to accomplish booking additional villas for the same week. The only fees incurred for additional units that are not booked as guaranteed weeks are housekeeping and transportation charges. IS THERE AN EXCHANGE PROGRAM AT OTHER PROPERTIES ESTABLISHED FOR MEMBERS AT ESPERANZA? Yes. You are provided with the exclusive benefit to trade your planned vacation weeks at Esperanza with owners at the other luxury resorts within Timbers Collection via Timbers Reciprocity Program. For more information about Timbers Reciprocity Program and each of the properties that make up Timbers Collecion, visit www.timberscollection.com/trp. Additionally, owners can also exchange with Auberge tradable properties powered by Elite Alliance. WHAT ARE THE ANNUAL MEMBERSHIP DUES AT ESPERANZA? The Membership dues at Esperanza are estimated at $11,903 for two/three bedroom, $20,335 for four bedroom, $25,576 for oceanfront suites and $3,508 - $4,378 for fixed weeks. The annual dues cover all maintenance and upkeep, maid services, utilities, insurance, property taxes, reserve fund and trustee fees. WHAT OTHER EXPENSES WILL I INCUR AS A MEMBER AT ESPERANZA? There are no additional fees for using a two-bedroom villa. There is a housekeeping fee of $250 per week for enjoyment of a three-bedroom villa. As well, Members have chosen to pay a la carte for airport transportation, which is offered by Auberge with an Owner's discount. And, a 25% surcharge is added to any pre arrival groceries delivered prior to the arrival. Nothing more, and in fact, Esperanza Owners enjoy the Auberge family discount at any Auberge property, applied to any incidentals enjoyed during your stay.